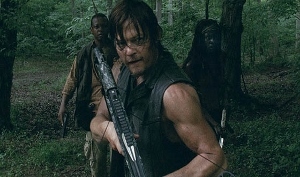 A new trailer for The Walking Dead was released at Comic-Con 2013 in San Diego. While I was left a little disappointed with season three, I can’t wait to see what happens in season four. Looks like there will be a lot going on at the prison (there better be, considering the stagnant second half of season three). Season 4 is scheduled to start Sunday October 13, 9PM on AMC. The season four premiere of The Walking Dead will coincide with AMC’s annual Fearfest marathon of horror films. And if you haven’t had your Walking Dead fix in a while, you can catch the Walking Dead marathon beginning October 7th. Like last year, the season will air in two parts – the first eight episodes airing in the fall, with the second half of the season returning February 2014.